Your Rift is almost ready to ship, and your order will be processed in the next 1-3 weeks. For some customers, your actual ship date may differ from the estimate you saw when ordering. Do we have your correct billing and shipping information? Is your payment information accurate? Is your PC ready to power Rift? You can use our compatibility tool to check, or learn more about our Oculus Ready program. Do you have an open HDMI port on your graphics card for Rift? You might need an adapter if the port is already in use for your monitor or TV. Thanks for being part of the future of VR. We can't wait for you to see what's next. Congrats! hopefully your order is on the low end of the 1 to 3 weeks. Alright, found some more information. "Kickstarter units will start arriving today, and the first pre-ordered Rifts will start shipping mid-week and arrive soon after. We’re working as fast as we can to get Rifts to customers who pre-ordered. If you pre-ordered, you’ll get an email when your order is being prepped (1-3 weeks prior to shipping) and then another one when your payment method has been charged and your Rift is on its way." Second, for those of you who pre-ordered an Oculus, you don't have to wait till the day it arrives to install the software and hit up the Oculus store! This is exciting, I haven't looked forward to the release of a game like this since FFXIV:ARR, more likely not since Majora's Mask. I can hardly contain myself. No Oculus yet, and they've yet to charge my account, so I assume I'll be waiting till at least Friday, but more likely next week. Not disappointed by this, kind of gathered this would happen. I've installed the Oculus Store and have installed the few free games available, really excited about the games. the VR Rollercoaster on my smart phone, I doubt I'll be getting motion sickness from Eve: Valkyrie or anything else. decent guides on how to avoid these problems. Apparently people were getting orders in before the top of the hour in release. 7:45 (UMT) saw pre-purchases from that point until about 8:01, when the server began locking up. Now initially, we believed that order numbers, XX24XXXX or however, was the litmus for a general delivery window. We now know that is only partially true, and that the real information indicating shipping and charging order was actually the time in which it was ordered. Orders started back up at about 8:06, when orders were once again made available to purchase.
" ...I am not going to wax poetic about this, since I have done so in the past, but bottom-line: I won't give in-depth updates on any situation without knowing it is solid, true, and finalized. Until I can do so, the best I can do is remind people that I will get them information as quickly as I can. On the rare occasions when things still change, even when they change for reasons out of my control, I get crucified anyway. Sometimes that means updates have to wait until things get locked down, and sometimes that means waiting a little longer to give everyone good info." A guy under the Name VR-Researcher is making some dubious claims about processing, apparently implying that Lucky cannot make a statement because of a NDA regarding failure of the processing company to pull through on it's own contract. There was also a statement about Palmer paying out of pocket to make good on the problem. I'm still pretty excited for Oculus, even if the industry does sometimes seems a little jinxed. Update: Still no Oculus, but on April 11th I finally received an email which gave me a new time window-- May 2nd - May 12th. Sad but true. In the mean time, if anybody is interested, please check out my Youtube channel, which, while currently missing the VR element I'm working very hard to incorporate, is quality enough to make you giggle. https://youtube.com/channel/UCCoyhBz5STccW39oT0y24Pw Subscribe to help me reach 100 for that special Custom URL we all want! messed up thing with this is, I ordered a rift from oculus, and am getting the same run around my shipping dates like some time in August. I ordered one with a PC from amazon.com and got it in two weeks. Oh yeah, I know all about it. It's ridiculous out there. I'm so close now I can taste it though, so no point in that for me, but BAD OCULUS! BAD! So today is the day! 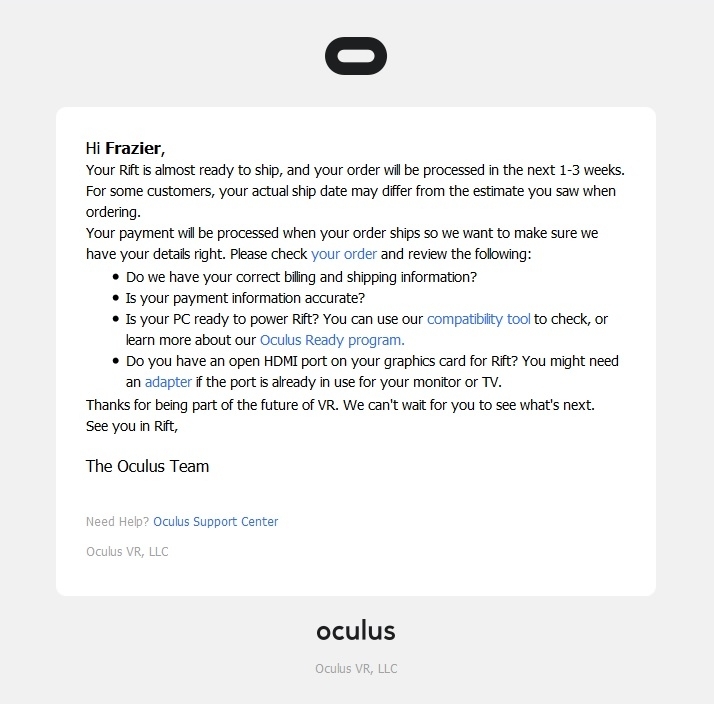 I've just received my confirmation notice from Oculus, and I am on the lookout for my tracking number! Today has been by far the most productive ship date Oculus has ever gotten through, coming up a whole minute through the rankings, from 6:00 to 7:++ minutes, which is a big deal. More to come when I receive the beast! hey @gleamingsands very jealous I'm still waiting for anything from Oculus - luckily the shipping delays to Australia are now fixed and support have told me my window shouldn't change but I'm not holding my breath. And here we were in the US complaining about Australia seemingly getting shipped first. xD Have you seen the US Shipping Megathread on Reddit? It's funny @gleamingsands, it's as if the pursuit of the latest tech is also the pursuit of happiness. More than that even - the pursuit of a higher state of being. Delays seem to be preventing us from becoming all that we can be; from flourishing into the butterflies of our full potential. I wonder if perhaps it is a deep-seated, subconscious horror of the natural world and human violence that drives us towards the digital, the technological, the virtual? If technological improvement is equivalent to the pursuit of happiness, I think it's roots in this lay in labor saving devices which then allow us to spend more time on luxury items. The luxury items themselves, except where they themselves save labor, are not in and of themselves inherently intrinsic to happiness; this is readily perceivable through non-materialist view points such as those which Buddhist monks embrace. Materialism in and of itself actually enslaves a creature to a segmented will within itself, one which is driven to animate the creature to do more work than is actually necessary to subsistence in order to fulfill some unnecessary desire, except where this desire is beneficial in evolution. That's where this special brand of technology comes in, the first step towards full sensory exposure and subsequent human augmentation is one avenue of fulfillment of futurist utopian dreams, but it should be readily understood that utopia is a paradoxical concept, as everywhere it is applied, under each of it's guises, it tends to bring about the opposite of the intended connotation of the word, the root of which actually means nowhere incidentally. I feel like if we don't temper our concept of self-fulfillment with an understanding of what we can actually achieve as human beings, we ultimately set ourselves up for a disappointment much more horrifying than the human violence that we bring against ourselves or the more eloquent, often subtle forms of violence that nature can provide. Human aggression has a built in limitation, nature provides this limit, but technological violence has the potential to exist forever. Sorry, got a bit silly there. Rift is due tomorrow! My rift is here, and with it comes another video! Beautiful! congratulations @gleamingsands - I'm still waiting for something from Oculus - it's Day 2 of my estimate and still nothing..
loved the video - awesome..
Man that's terrible. Oculus is just dropping the ball and dropping the ball; have you considered taking up Oculus on it's offer to let you buy one from Best Buy and sending in the code for verification? I hear they let you keep your place in line for the Oculus Touch and Valkyrie code.